Discover All the Great Offerings at #NCDD2018! #NCDD2018 is almost here! Just another day until our pre-conference sessions kick off on Thursday and we couldn’t be more excited to start seeing folks again! In order to really get the most out of #NCDD2018 we encourage you to check out the extra offerings at the conference, in addition to our inspiring speakers, over 60 workshops, and 30+ presenters at the D&D Showcase. The full conference schedule is on the NCDD blog and make sure you check out the interactive, digital version hosted by Konveio! Share your thoughts here on the blog about the conference theme and how to amplify the work of D&D. Get started on the conference networking early by connecting with other attendees here. If you are looking for a room share at the Sheraton, folks are posting here. Finally, if you haven’t gotten your tickets and you’d like to join us, we have 3-day and single-day tickets still available here. That’s all, folks! Can’t wait to see everyone at the conference! We are thrilled to offer five exciting day long and one half-day pre-conference sessions on Thursday, November 1, 2018, prior to the start of NCDD 2018! These sessions are great for people of various levels of experience, and offer a variety of topics. Read through these descriptions and go to ncdd2018-precon.eventbrite.com to register! What is Participatory Budgeting and how can it work for me? We welcome all folks participating in pre-conference activities and conference attendees who have arrived early to join NCDD’s Staff at Mix16 Lounge in the hotel lobby for an informal meet & greet! Join a late night discussion about dialogue and racial privilege after the WPS community kick-off event. Come upstairs around 8:30pm to the 15FIFTY Restaurant & Lounge for a loosely facilitated conversation to explore how WPS attendees & NCDDers can do better together. For planning purposes it would assist the presenters to know if you will plan to attend this discussion circle. Please fill out the brief form here. This lunchtime breakout session is a circle in action. For general information about BFC please see our workshop on Friday Nov. 2nd , Session A. Explore downtown Denver and go out to dinner with new or old friends… We’ll provide you with all you need to organize your evening out! Conference sponsor Civic Dinners is offering to help people run their own Civic Dinners Saturday night. Civic Dinners helps people transform dinner tables into forums for positive social change. Our friends at Civic Dinners are happy to help anyone who wants to host on any of their three national topics: Bridging the Racial Divide, The Voice of Women, or Common Ground (just launched!). Civic Dinners will be getting people to sign up during the Showcase/Reception on Friday afternoon. Those of you who’d like to host something at a restaurant or, even better, local folks who’d like to host a Civic Dinner in your home, can plan to do so! If this is of interest to you, email Jenn Graham at jenn@civicdinners.com so you two can connect on the details. Make sure you check out the full conference schedule for the line-up of workshops, plenaries, and more! On Monday, NCDD member David Campt will be holding one of his workshops, Dismantling Racism: One Conversation at a Time, on November 5th in Denver. Learn more and register here! In The Washington Post, Amy Gardner reads some tea leaves that might foretell youth turnout in November. Midterm performance is typically far worse: Just 16 percent of young Americans cast ballots in 2014. The highest midterm turnout among voters under 30 in the past three decades was a mere 21 percent in 1994. In Nevada, young voters’ share of the electorate was 18.6 percent in August, up from 17.5 percent in September 2017, according to L2. In North Carolina, it was 18.3 percent in October, up from 16.7 percent in September 2017. And in Florida, it was 16.6 percent in September, up from 15.6 percent a year earlier. THE YOUNG PEOPLE WILL … STAY HOME? — Remember all that talk of how “the young people will win” and come out in force in Florida, especially after the Parkland massacre? So far, it’s not happening. Voters between the ages of 18-29 are 17 percent of the registered voters in Florida but have only cast 5 percent of the ballots so far. They tend to vote more Democratic. Meanwhile, voters 65 and older are 18.4 percent of the electorate but have cast 51.4 percent of the ballots. And older voters tend to vote more Republican. A bunch of different statistics are being cited here: the number of voters or registrants in various age groups, the turnout (the percentage of eligible people in each category who actually voted), and the share of the electorate (what proportion of all voters fit in each category). These articles also cite statistics about registration, early voting, and total voting. It’s easy to get confused. I expect turnout to rise for the population as a whole, in large part because of the actual and perceived high stakes of the 2018 election. I think youth turnout will also rise but youth will face a challenge keeping pace with the general increase. 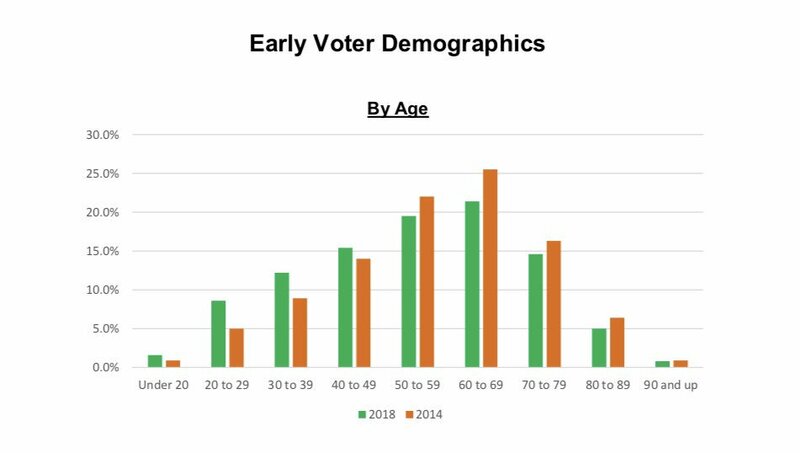 The difference between them and older voters will probably look better than in Dan Smith’s chart, because early voting seems to appeal especially to older people. But we could still see various scenarios. If youth turnout and share of the electorate both rise, it will be a great year for youth voting. Youth turnout could actually fall, but that would really surprise me. If youth turnout rises but no faster than–or not as fast as–the turnout of older people, then youth share will shrink. This will be reported by many news outlets as a decline. That interpretation will not be an outright error. If you want to exercise more influence on the outcome, you must increase your share of the vote. A flat or shrinking share means having no more influence. Also, if turnout rises but youth turnout rises less than average, it will pose questions about the impact of the nonpartisan and partisan efforts specifically to engage youth. But it will also be true that more youth have voted, which will be worth celebrating if you care about youth engagement. And it will break a pattern, because historically youth turnout has been remarkably flat in midterm elections. Breaking that pattern might be a small positive step even if youth share shrinks slightly. NCDD member, Everyday Democracy – a sponsor of #NCDD2018, recently announced they are seeking applications for their new Institute for Community Change Leaders program. The Institute will be a year-long experience to strengthen leadership and community building skills through a racial equity lens. The first part will be a five-day retreat in December to learn and build relationships with your fellow cohort; then design a plan over the following year to address an issue your community is facing. Applications are due November 9th. You can read the announcement below and find the original on Everyday Democracy’s site here. Strengthening democracy in our country and communities will depend on strong, diverse leaders – leaders from all backgrounds and ages who have the skills, knowledge and courage to help people engage with each other across difference, understand and embrace racial equity, and create equitable and sustainable community change. You want to improve your skills in engaging the community in dialogue to address tough public issues with a racial equity lens and sustained, people-driven impact. You see the potential of Everyday Democracy’s Dialogue to Change approach for your community and want to learn more about how to apply it. The Institute begins with a five-day learning experience designed to help leaders from a variety of sectors deepen their knowledge, skills, and readiness for leading community change in inclusive, participatory and equitable ways. The Institute is designed for leaders in a variety of sectors and settings who care about engaging the community in dialogue and change with a racial and intergenerational equity lens. Whether you are a neighborhood problem solver, community organizer, faith leader, school leader, public official, non-profit leaders, or another kind of concerned resident who wants to improve your community’s ability to cross divides and work together in equitable ways, this is for you. We welcome folks from every stage of their leadership practice. The practicum and retreat will take place December 10 – 14, 2018 in a hotel and conference center located in scenic south-west Connecticut in the vicinity of parks, museums, and gardens. The facility includes a spa, which participants can enjoy at their own cost. If you are flying into Connecticut, use either Bradley International or Tweed New Haven Airports. Your payment of $500 that includes an entire year-long experience will cover your lodging (up to five nights), breakfast and lunch each day of the retreat, and all materials. Other meals and your travel will be your responsibility. If two people are able to attend from the same community, your combined cost will be discounted to $850. If cost is a barrier for your participation, please apply for a scholarship. The application period ends November 9, 2018. Individuals will be notified regarding acceptance by November 14, 2018. Click here to download the application. We all have a spark within and we choose every day how we will or will not use our spark. In our NCDD community, we spark conversations–dialogues that change hearts and minds and steadily change the world. Our sparks can be small or big, but we must work intentionally to ensure that the sparks catch fire. What do I mean by this? I mean that it is up to us, as those working firsthand in the creations of spaces for dialogue and deliberation, that we do not work in isolation. Like the catalysts in science, we must interact with others to create the chemistry worth having in our world. Libraries Transforming Communities is a joint effort by the American Libraries Association and NCDD. The initiative is founded on the strengths of the library as a trusted public community space and a place ideal for D&D work and is intended for use by libraries around the world to facilitate healing and idea generation via D&D. The Center for Public Deliberation at Colorado State University has the mission of enhancing the local civic culture through increased participation and know-how of how deliberation works. Through elevating conversation via civics education, the center celebrates how crowds conversing (rather than arguing) can create better ideas for the whole community. They also recently won a Civvys Award for Local Winner! The David Mathews Center for Civic Life based in Alabama believes in public forums and have locals define the issues and come together to solve them. The center provides education, services in moderation, and setting up community engagement events. Make America Dinner Again empowers everyone to act locally with dinners of 8 and 2 moderators that discuss tough issues with an emphasis on respectful conversation and delicious food. We hope these examples evoke excitement for the D&D community (and for the upcoming conference)! In true NCDD form, we want to engage this community of innovators in discussing how we build capacity for D&D in more communities and design action steps to make this happen moving forward. How have you succeeded in building capacity for engagement in the communities you serve? What do you think the next innovations might look like for dialogue, deliberation, and engagement? What do we need to discuss and think about together as a field, in order to succeed in broadening the use of D&D? We hope readers will share below their own stories of successes, ideas for new innovations, and even the challenges that we need to tackle collectively in order to achieve this goal of bringing dialogue, deliberation, and public engagement to more communities. Share your thoughts below and engage with others’ responses. NCDD’s staff will be sharing your input at the conference to help us jumpstart further conversations and collaborations we hope will help us all take our work to the next level. You can still join us at #NCDD2018 – get your tickets today! Stay tuned for the follow-up post, “We Are All Catalysts: Part 2”, where we will shift from examples to best practices to help everyone begin or continue to strengthen and amplify their dialogue and deliberation initiatives! In case you missed it, NCDD member David Campt will be holding one of his workshops, Dismantling Racism: One Conversation at a Time, on November 5th in Denver! The session will be a great opportunity for those folks looking to strengthen capacity for having anti-racist conversations and to learn skills around empathy, active listening, and more. He is offering NCDD2018 conference attendees a special discount, so we encourage you to utilize this fantastic offer! Learn more about the workshop below and register for the event on Eventbrite here. Do you struggle as a white person to respond in social or work situations when someone makes a racist comment or questions the reality of racism? Many white people are at sea in these situations. We need tangible tools and skills to participate in healthy, productive, and effective dialogue with racism skeptics. Scientific evidence shows that empathy-based dialogues can change adults’ minds. Participate in this vital conversation! Learn how to use empathy, active listening and relating skills in conversations about racism in a comfortable workshop setting. Enter code NCDD at checkout! This workshop was developed and is facilitated by David Campt, PhD., nationally known African-American author and lecturer. David works in the areas of community engagement, conflict resolution, inclusion, and equity. His clients have included large corporations, the White House, the US Military, and nonprofits. He is known as The Dialogue Guy. You can learn more about him and this work at www.whiteallytoolkit.com. Paid parking is available in the lot next to the Sie International Relations Complex. $2/hr. The entrance is off of Iliff Ave. Street parking is also available, though extra walk-time is advised. David is a nationally recognized expert in race relations and civic engagement. A dynamic and engaging speaker, facilitator and trainer, he teaches strategies for changing attitudes, behavior and group culture through dialogue.